What Can I do in school to prepare for a career in Engineering Technology? Keep up with math and science – don’t let your skills get behind because each step of knowledge builds on the one before. Take part in science fairs or field trips. Join science or math-related clubs. Read about science – achievements, people and events. Play video games that challenge you to think logically. Enroll in the Black Hawk College summer camps. Take math courses: Algebra I and II are recommended. Take science courses like physics. If your high school provides career training, look into a drafting or electrical technology class to gain practical knowledge. Welding courses provide background in materials and fabrication. Ask about an internship with a local company involved in technology or look for a part-time job on your own. Volunteer for organizations in fields related to science and technology: manufacturing, engineering consulting firms, or any company that uses process controls system. Take field trips to colleges or visit during high school visit days. Black Hawk College hosts a College Night each fall. Make an appointment to see an advisor at the college you will attend after graduation or ask for a handbook or catalog to get program information or see what classes you will need to take. Find a mentor (on the job or internship or among teachers and family members). Visit a faculty member in the Engineering Technology program. Read about science and technology innovations. Keep your mind open to lifelong learning, starting now. 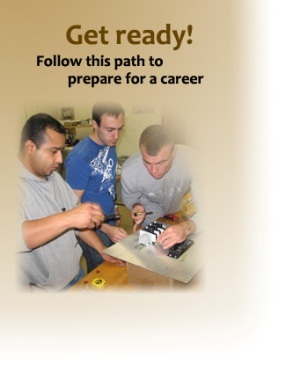 The Engineering Technology program at Black Hawk College gives you many options. Complete a certificate program or a two-year associate’s degree and look for a job immediately after graduation. Certificate courses will apply to the Associate in Applied Science Degree, which will give you better job opportunities. You may also transfer credits to a college or university for a four-year degree. See the specific courses needed for all seven of Black Hawk College’s certificate programs or the two-year Associate in Applied Science degree and related tracks.